This do-all combo is ready to hit the streets. 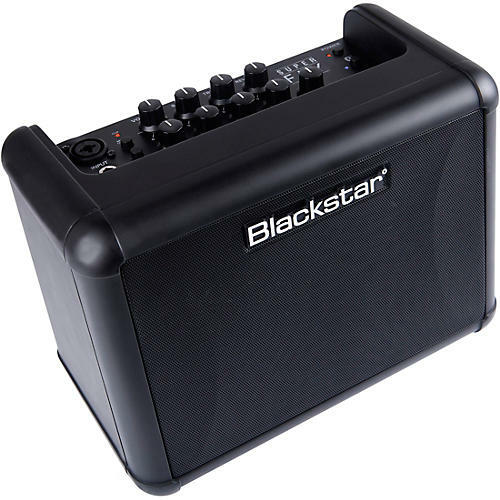 The Blackstar Super Fly is your take-anywhere street performance amp. With separate microphone and instrument channels, battery power, plus Bluetooth connectivity, it delivers your performance with power and clarity in any location. Channel 1 has an XLR/jack combination input for use with microphones or line level instruments. Channel 2 is for guitar, either electric with clean and overdrive, or a specially voiced acoustic setting. Each channel has its own separate EQ and reverb controls. It’s easy to pair a Bluetooth device for jamming along to your favorite tunes with the Super Fly’s two 3" full range speakers that deliver 12W of power. When you’re using it in the street the handy built-in tilt back stand ensures your playing is heard. For portability it runs on 8 x AA batteries, or there is an optional rechargeable battery pack that Velcros discretely to the back of the unit and gives 15 hours of playing time. Two input channels: mic XLR/line; instrument 1/4"